If you have knowledge of Australian politics, and-or are interesting in contributing to an Australia 2019 campaign, please let me know in the comments below or by e-mailing at https://270soft.com/contact . We are going to be going ahead on an Australia 2019 campaign for the May 18th election. Prime Minister Infinity – Canada will have a sneak-peek released soon, including Alberta – 2019 along with the latest game engine. Here’s a screenshot from a recent run through, where I was a spectator as the AAP. 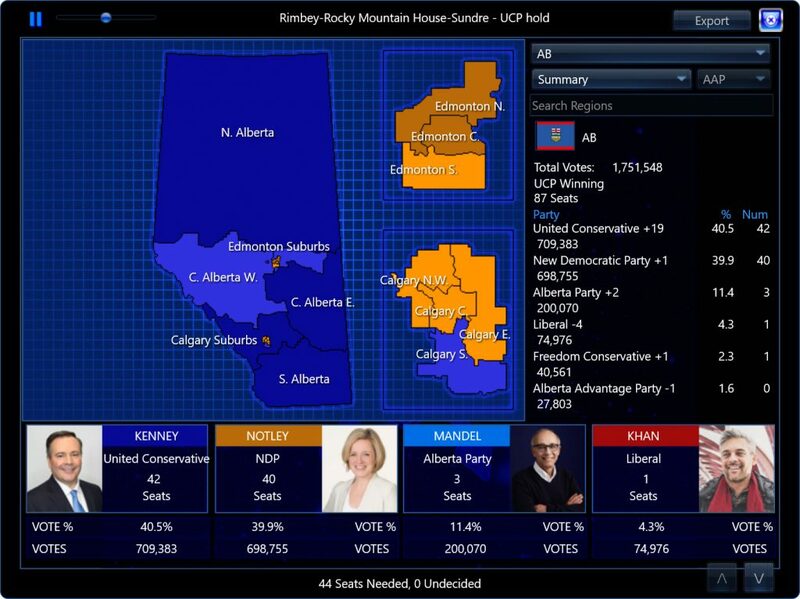 Notley almost closed the gap with the UCP, finishing strong and leading to a minority UC government (44 seats required for a majority). No negotiations were successful between the UCP and Alberta Party, so it will be vote by vote for the new government. Just finishing up the Alberta – 2019 campaign right now, it will probably be released later today Saturday. 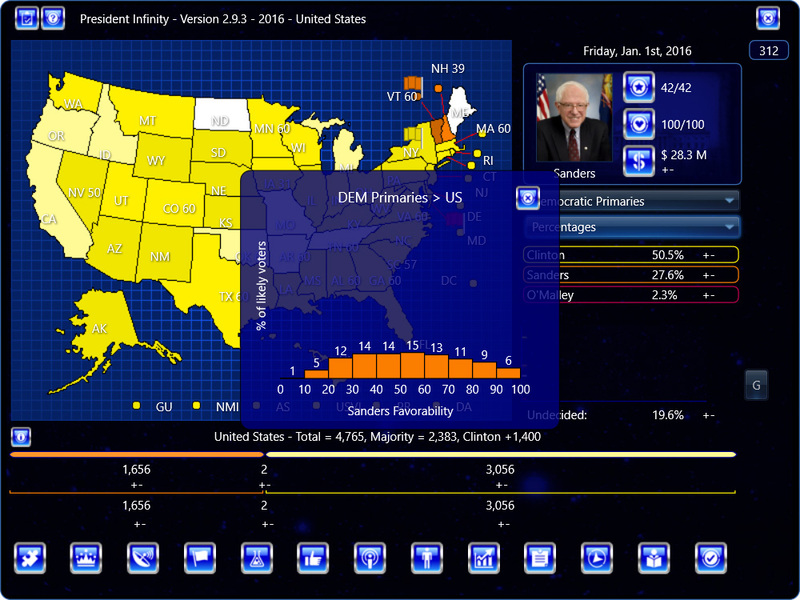 President Infinity v. 3.0.1 sneak-peek for Windows has been released! This sneak-peek fixes a load bug, fixes a bug with selecting debate focus, adds 4 ‘what-if’ candidates to 2020 (Ocasio-Cortez, Crenshaw, Gillum, and Abrams), and more. All features are goals, not promises. All dates are estimates. List subject to revision. Spring 2019 cycle is to approximately June 1st, but there will be releases before that with some of the features. Networking is planned for Summer 2019, and applies for all products. Voting blocs is also planned, probably for Summer 2019. Features already in sneak-peek (Favorability, 0-10 Attributes, Map pop-up info, window resizability) to official. United States – 2020 (this campaign will then be updated as we move towards 2020). New polling system (created by actual random sampling of population which is now modeled at a low level in game engine, different pollsters with different biases release public polls which player can then weight accordingly, can release internal polls to drive news). 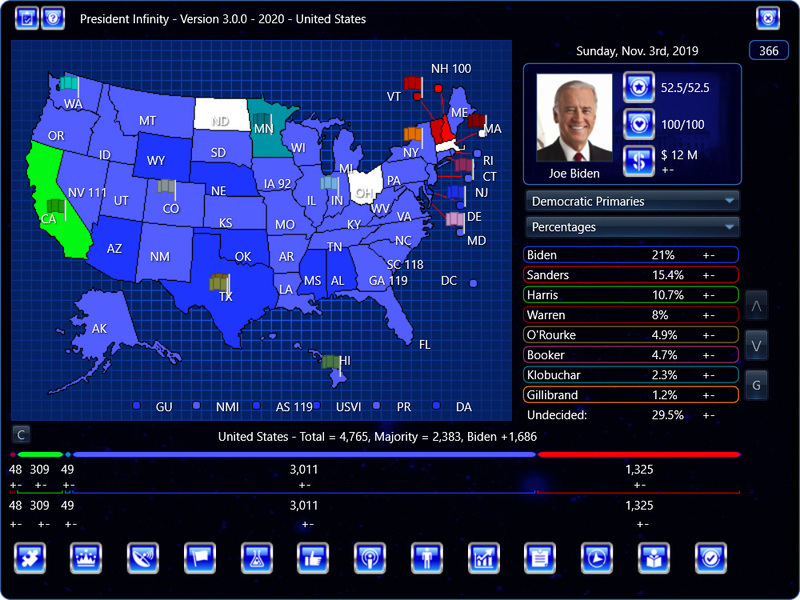 New graphs system (improved charts, works with new polling system including creating best-fits for multiple polls). Primaries > Can view hypothetical head-to-head match-ups for %s, seats, pop. vote (depends on new polling system, and expands the ability to select the candidate viewing from each party’s primaries introduced in Autumn 2018 but which was only available for Favorability and Momentum). California Governor – 2018 official campaign added. See President Infinity 1., 3., 4. Personal attributes are Leadership, Integrity, Experience, Issue Familiarity, Charisma, Stamina, Debating, Ideologue, and Ambition. The descriptions for Personal Attributes which are also Issues (Leadership, Integrity, Experience, Issue Familiarity) are as follows (you can see these on the Player Info > Platform screen). These values are considered relative to a typical candidate for, in this case, President. Below, each personal attribute is addressed in specific, including a working definition and how it works in the game. Definition: Leadership is a composite, and includes visionary, strategic, and managerial leadership abilities. These can be demonstrated in government, business, or other organizational leadership roles. It is the ability to inspire or get ‘buy in’ from people to follow and then effectively lead them to the desired result. There are various styles of leadership, from more cooperative to more authoritative to more inspirational, but the important point for game purposes is that it gets results. It’s important to note that it’s not just that they had a leadership role, but the quality of their demonstrated leadership, that affects the Leadership attribute. In some cases, a candidate won’t have a track record, and so the designer will have to make more of an educated guess. Definition: Integrity includes both political integrity (does a politician keep their promises in the public sphere? are they ethical in their public work?) and personal integrity (do they say what they believe or what is expedient? are they hypocritical? do they lie or engage in other obviously deceitful behavior in their personal lives?). How it works in the game: affects Barnstorming (including Rallies), Scandals being researched on candidate, Spinning scandals by the candidate, Integrity issue. Definition: Experience is experience relevant to running a campaign and then being a politician in whatever role they are running for. This would include familiarity with things like barnstorming, interviews, media relations, legislative processes, and so on. How it works in the game: affects Barnstorming (including Rallies), Spinning, Gaffes, Backfires, Experience issue. Definition: Issue Familiarity is familiarity with both general aspects of various issues of the day, but also more specific facts. Therefore it helps in particular with interviews and debates. How it works in the game: affects Barnstorming (including Rallies), Interviews, Debates, Gaffes, Issue Familiarity issue. Charisma includes personal magnetism, charm, and good looks. It comes across when campaigning (whether small-scale barnstorming or large-scale rallies) and also can be capitalized upon for ads or even televised debates. How it works in the game: affects Barnstorming (including Rallies), Debates, Ads, Fundraising, Speeches, Interviews. Definition: Stamina is personal energy and work ethic. It is not only the ability to work, but the inclination to do so. How it works in the game: increases Energy Points per day. Definition: Debating is the intuitive or trained ability to debate in various formats like televised debates, interviews, town halls, or even dealing with tough questions while barnstorming or hecklers. How it works in the game: affects Barnstorming, Debates, Interviews. The Ideologue rating affects the likelihood a computer player will enter the primaries if Undecided, and stay in even if they can’t win. Ambition affects the likelihood that a computer player will enter the primaries if Undecided. President Infinity v. 2.9.8 sneak-peek for Windows has been released! This sneak-peek fixes a bug causing large % shifts on primary day, and a Main Screen bug where up and down arrows wouldn’t change players listed if in momentum mode.